This could be one of the most hyped first half series in years. The Phillies take a trip to D.C. for their first visit to Nationals Park in 2012. Since January this weekend has been known as “Take Back the Park” weekend for Nationals fans. Tickets were hard to come by as the Nationals limited the tickets sold to people who’s credit cards were registered in Maryland, Virginia, or D.C. Something tells me that there will still be an abundance of Phillies fans at Nationals Park this weekend despite the “Natitude” campaign going around D.C. to try and keep Phillies fans out of the park. Charged with the responsibility of following up Joe Blanton’s Thursday afternoon gem is Kyle Kendrick as he will face off against Nationals ace Stephen Strasburg. Kendrick (0-2, 6.59 ERA, 1.89 WHIP) went six innings allowing three runs (two earned) on five hits while striking out seven in a 5-1 loss to the Cubs last Sunday. In Kendrick’s previous start, he allowed seven runs on 11 hits over three innings in a 9-5 loss to the Diamondbacks. He is still looking for his first start of the year. Strasburg (2-0, 1.13 ERA, 0.88 WHIP) went seven innings allowing just one run on five hits and earning a no decision in the Nationals 4-3 loss to the Dodgers last Saturday. The Nationals, as a team, are 4-1 when Strasburg has started this year. The Phillies (13-13) are looking to build off of a solid series sweep of the Braves earlier this week and close out their six game division road trip with a win against the division leading Nationals (16-9). 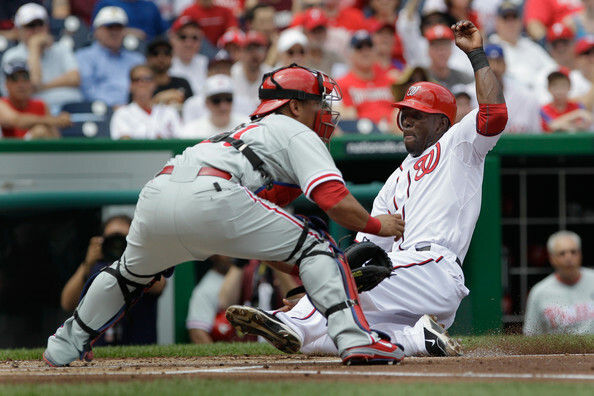 The Phillies dropped nine of their last 11 meetings against the Nationals last year. Top prospect Bryce Harper is making his home debut for the Nationals tonight in D.C. With Michael Morse and Ryan Zimmerman on the disabled list, the Nationals are scraping for some runs. Yesterday Adam LaRoche was scratched from the lineup with oblique soreness and is listed as day-to-day. First pitch is slated for 7:05 pm at Nationals Park. The game can be seen on The Comcast Network and heard on 94.1 WIP.